by far our fastest selling product ever... Just $399.00 or four easy payments of $99.75! I know, this is a crappy video. I'm a one man band and waiting for some good weather to get out to shoot another video. Just to be clear, this technique takes some getting use to, some broken string, but success is sweet. Take you time, learn the technique. 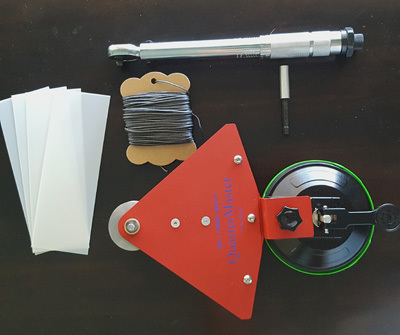 It is cutting the adhesive in a different direction than normal winding tools so slow down. 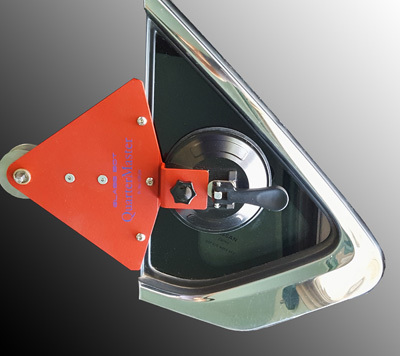 This patent pending design quickly removes quarter-lites without paint or molding damage. Forget the heat, forget the knives, forget tight spaces. Enjoy the benefits of using the newest product on the market for quarter glass removal. Paint damage during this process is the number one complaint when the current tools / techniques are used. The QuarterMaster mounts to the exterior of the part and after inserting the filament alongside the outside of the part, you begin winding and tensioning. Attach to vertical edge of the quarter lite. Work cutting element behind molding using Tuck Sheets and a slight sawing action to allow it to slip into position. Anchor one end of cutting element to body of QuarterMaster, insert the other end of the cutting element into the through-bore in shaft. Attach Tip Extension to shaft (do NOT use a socket) and using the Torque Wrench begin tensioning the cutting element. the cutting element has breached the adhesive bead and the tension is reduced. You can then spin the Torque Wrench at a faster rate. Tuck Sheets should be used to protect the vertical edge of the part as the cutting element works it's way under it on the finial cut. 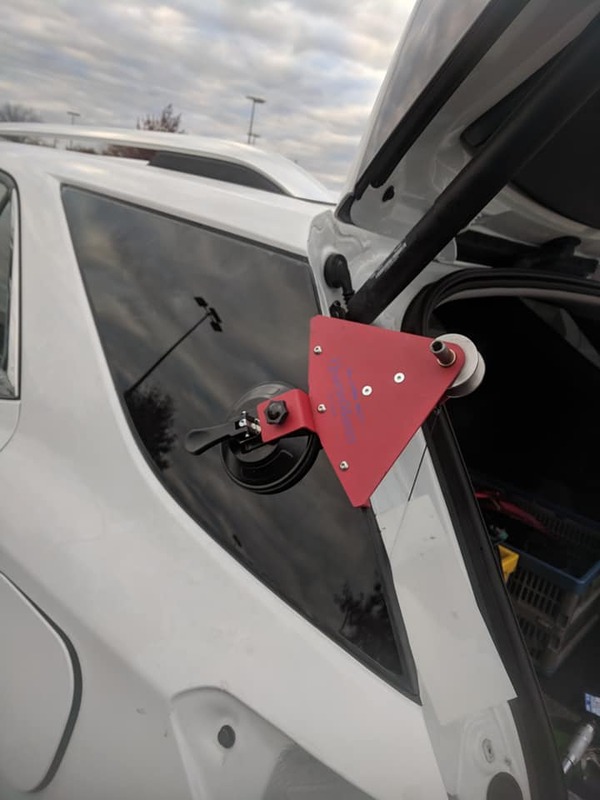 The first "purpose built" auto glass tool for quarter lite removal. FREE while supply last - One Torque Wrench (lifetime warranty) not a standard item for the kit. Comes to you in a custom foam-lined carrying case. Listen for the "click" then back off. You can go higher and find the actual breaking strength, then adjust down to 10 to 20% below that to reduce breakage. 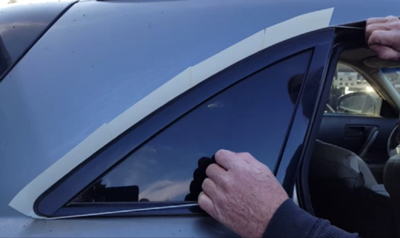 No wire starter required, you just ease the cutting element behind the glass like you normally would, you just no longer need to fish it into the interior. QuarterMaster Update: Report from the field. At this point I would suggest a alternate method of removal on Nissan quarter glass parts. I've been throwing myself at these models with the QuarterMaster, using wire and a variety of different strength and strand count filaments (300 to over 400 lbs bs) and the adhesive system on these parts are not cooperative. Save yourself some effort on Nissan's and use a different tool. That is all. Quote from one of my first QuarterMaster customers. Todd Young So glad I got this. Been doing glass over 30 years. Easiest equinox I ever cut out. Click the button below to add the Glass Bot® QuarterMaster to your wish list.